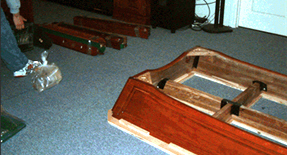 Cushion Replacement – Slow or dead rubber cushions can ruin the fun pool tables can provide. Let us restore your table to new or in some cases better than new playability. We calibrate the nose height of each cushion set to within thousandths of an inch to give almost any table tournament-quality speed & control. We can also adjust the size of the pocket openings to make a table play easier or more difficult. Pocket Replacement – Whether it’s a repair or an upgrade, we offer color-match leather net pockets that can enhance the beauty of your table. We have pockets with fringes, shields, or custom designs that fit most modern tables as well as many hard-to-find replacements for antique pool tables. We also carry bucket pockets and pocket liners for commercial-style tables with or without a ball return. Cue Repairs – Our in-house lathe shop offers a wide variety of cue repair services including tip and ferrule replacement, shaft reducing/retapering, cleaning and reconditioning, and linen or leather rewrapping. We carry dozens of leather tips ranging from Elkmaster and Le Pros to laminated tips like Talisman and Moori. Repairs generally take less than a week and can often be done while you wait (please call to inquire about immediate repairs). 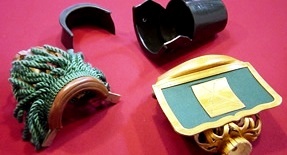 Assembly, Disassembly and Moving – trust the experts. Assembly – We will assemble your table in a desired location, and can also give you expert advice on placement for optimum playability. We then ensure that the slates are leveled with a machinist’s level to tolerances that exceed BCA (Billiard Congress of America) specifications ,and set and fill all seams and screw holes (if needed) with special epoxy or wax. The cloth is then meticulously stretched and applied and finally the rail system and pockets installed. Disassembly – We carefully disassemble the table, number/label the parts, sort and bag the hardware, and box the cloth, pockets, and smaller items. The table can then be safely moved or stored with the knowledge that it can be professionally set up again at a later time. 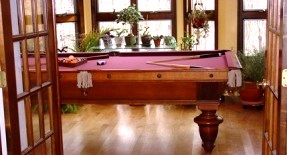 Moving – Pool tables can weigh in excess of 1,000 pounds, so moving them safely should be of paramount concern. We will disassemble the table as described above, blanket wrap it for safe transport in our vehicle, then carefully bring it to its new location for precision reassembly. We can also temporarily place a table on special dollies so that it can be safely moved around within a room to allow the installation of new flooring. Recovering – Is it time to replace worn or damaged cloth on your table? Are you looking to change to a more exciting or better-matched color? Let our experienced technicians expertly apply new cloth to the bed and rails of your table. For standard usage and play, we carry Perma-guard coated billiard cloth which provides the playability of a standard fabric combined with exceptional spill resistance just in case! For those looking for professional playability and appearance, we carry Simonis in your choice of 16+ colors. (please click for color charts) We now also include our proprietary precision leveling procedure as part of the recovery process, which involves extensive use of a machinist’s level and tolerances to within +/- .005″. Game Room Design – Not certain how to put together your game room? Let our trained sales associates assist you. With over forty years experience we can help you select a pool table, game room furniture and accessories to complement the look of your home or even define the look of your home!